The Incas had an extensive road network in South America, especially in current Peru, Ecuador, Bolivia and Chile. These roads were generally well paved and the Incas offered a relatively fast form of transport through the Andes mountains. 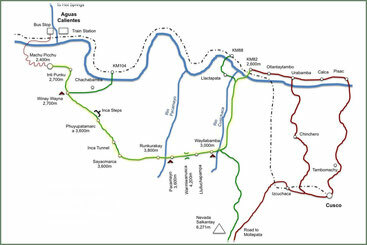 The road network had a total length of about 22,500 kilometers and rose to an altitude of 5000 meters above sea level. The Incas used no cars and did not have horses until the arrival of the Spanish conquistadores in the 16th century. The roads were therefore hiking trails and were also used for transportation with lama and other animals. 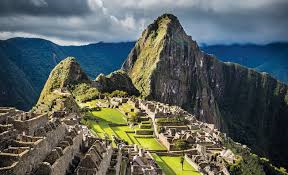 At the time of the Incaempire decline around 1532, the Inca empire was the largest state ever existed in pre-columbian America. However, this could never have grown to such a size without the network of roads that allowed transport, communication and administration at a high level. Numerous roads followed like arteries to the heart of the empire, the capital Cuzco. This was a strategically good location, which greatly accelerated centralization policy. It was the road network on which the greatness of the empire was built. It is therefore not strange that this system is considered one of the largest achievments of prehistoric America. Without a doubt, the 4-day hiking path on the Peruvian Inca trail is the best-known and most popular tour you can do in South America. This walk is done by thousands people annually, despite the fact that numerous similar treks (also Machu Picchu) are organized. The path is 33 km long and is this is made by the Inca’s itself and goes from the "Holy Valley" to the ceremonial city of Machu Picchu. The path leads up to about three tall mountain passes and lies like a snake through the beautiful scenery of forests, rivers and high non-forest plains. After you joined a (tour)group in Cuzo you will be picked up and the group drives by bus to a place where you can quickly do some groceries. After that it's another half hour in the bus. 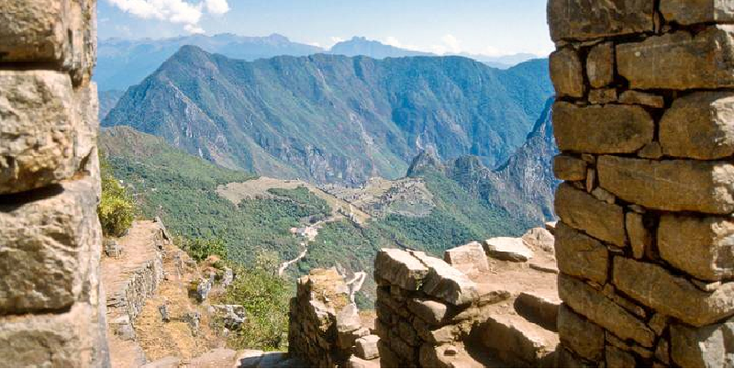 Most tour operators start the trek about two kilometers east of the town "Chilca" (where you do not stop). From here it is about 33 kilometers to Machu Picchu. The start of the route is simple, flat with a slight stance towards the first stop of the day. There are various possibilities for camping which can differ day by day; usually the second day is the hardest day due to the high altitude difference and the steep climb that has to be taken. It's also the coldest night you get. Day 3 is also not easy and the last day is largely taken by your visit to Machu Picchu, which will be done early in the morning before the tour groups arrive. Your trip has ended, well at least the walking part. From here you will be taken by bus to a village called "Aqua Calientes", about 8 kilometers from Machu Picchu where there are hotels, restaurants and transport possibilities. 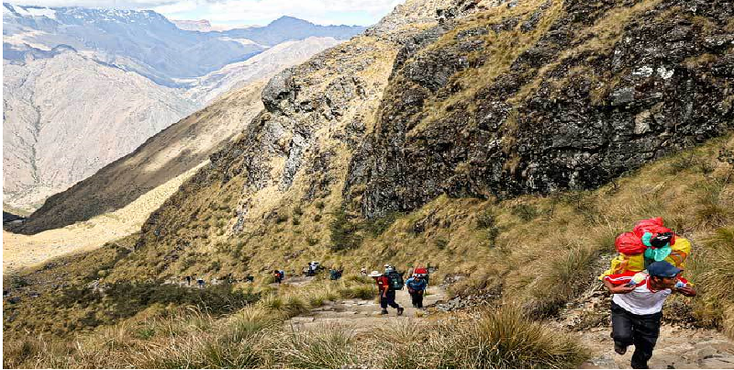 You are going to make a trek through the old Inka country; this region is full of beautiful nature in the form of high mountains (with snow), bare bushes surrounded by low-lying clouds, agricultural terraces, deserted villages, inka ruins, woods and wild rivers and creeks. You walk on ancient Inka stairs and assumingly pass rows of passing llamas, horses or donkeys and dots of local villagers. Groups leave all year through, only not in February, when the path is cleaned annually). In the wet (read: rain) season, which runs from December to April, the rocks are slippery the grass soggy, the camps soaked and the view is hampered by low-lying clouds. Of course there is also a lot of rain too. The cold months (the dry season) June to August are therefore much better but, on the other hand, much more busy. It can also be below zero during the night. Take a passport and money for registration and items (snacks), tip-money for a guide, carriers and cook and survive in "Aqua Calientes". On the other hand, a good sleeping bag is needed because if you don’t sleep at night due to the cold you won’t enjoy the trip. In addition, a good raincoat (poncho), sunglasses, sunscreen, insect spray, good (mountain) shoes, at least two pairs of socks, fitting pants, vests, hat (caps), snacks, good flashlight (with extra batteries), water purification pills and first aid items . It's a fairytalee that the Inca Road is so commercial that you can buy things at shops, sleep in hostels and can give all your stuff easily to other people (carriers) on the way. The only market you encounter is the village you visit before you start the hike. Only at the last evening you have the opportunity to buy soda (and beer). And of course in Machu Picchu yourself, you can buy things (nowadays) but they are very expensive. There are many options and opportunities to arrange you’re hike. You can arrange this at home and in almost every (tourist) city and place in Peru and far beyond. To my knowledge, still the best, cheapest (and most reliable) place to handle your "Inkapad-trekking" is near the site itself; in Cuzco for example. There are countless travel agencies that organize the hike. Check prices, options and ask (and read) other’s people experience with the organization. For example, ask if the transfer from Aqua Calientes is included and the entrance fees to Machu Picchu. Usually a tent, a cook, guide, transport (from and to the start of the trekkingplace), food and water are included. Extra things like soda are of course at your own expense. Ask for the assurance that the guide (also) speaks English (so you do not end up in a Spanish-speaking group). Acclimatize in Cusco before starting with the Inca Trail. In the Netherlands, you can not prepare yourself for the altitude differences of the Andes. The higher the sea level, the more the air will shine. This leads to faster breathing than usual. It is advisable to stay for two days in Cusco so that you can get used to the lower oxygen content. 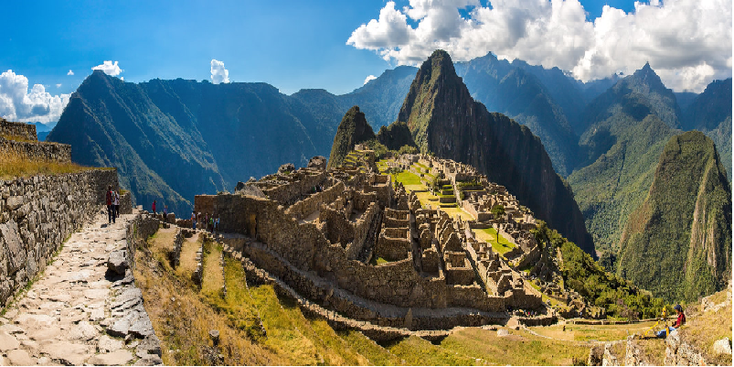 The mysterious ruins of Machu Picchu are one of the most intriguing places in the world. It’s on the sights that’s on the seven wonders of the world list. The site is situated on a small hill in the Andes, at a respectable height of 2,400 meters. In 1983, the city was included on the UNESCO World Heritage List. The site attracts around 400,000 visitors each year. The UNESCO fears that this large number of visitors will further damage the city. Since the 1990's, shops and hotels have been built and many new buildings are set along the ancient Inka path by which this city can be reached. Also, the prices for both the hike and a visit to the site have risen sharply.